"Todos con Trocadero Marbella Rugby Club"!!! 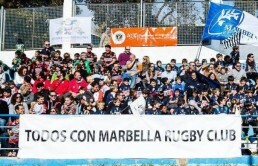 Embattled Trocadero Marbella Rugby Club has announced that its next match, held this Sunday, will have free admission. The club, which has had its account embargoed due to a disputed tax debt, currently lies sixth in the national league B, plays Union de Rugby Almeria. The uncertain future of Trocadero Marbella Rugby Club, which as well as its first team, also has over 250 youngsters of all nationalties training each weekend, has lead to the club announcing that this Sunday’s game will be free, to allow fans to show their support. The club has already enjoyed considerable support from rugby clubs from all over Spain, as well as international kit supplier Canterbury. Marbella’s water polo and basketball team, who have also faced difficulties due to the lack of facilities in Marbella, have also voiced their support. Kick off is at 12.30 on Sunday, February 5. If you do one thing this weekend, get to Bahia Marbella and support your local club and let’s make it a great day out!